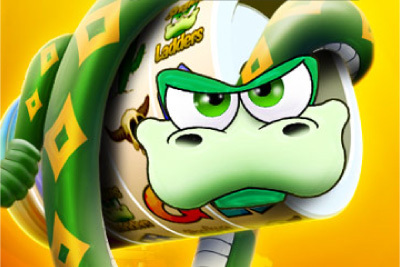 mFortune’s Snakes & Ladders fruit machine is a fun and cute classic mobile slot. Simple as it may be in graphics, Snakes and Ladders slot game plays beautifully on any device and you’ll find this slot difficult to put down. The coin range is limiting, not for the penny slot lovers, with a 0.90 minimum bet and with £/€9 maximum bet, it’s not quite high enough for high rollers. You have to give it credit for its fun bonus feature, where you go around a snakes and ladders board, hoping to get all the way to the top with the biggest multiplier available. The spin of the dice keeps you excited as you go around the board, at once hoping and not hoping to get one of the higher multipliers. And with a free spins bonus feature and decent payout, you’ll be happy this snake is one of your shortcuts on the home page of your mobile device. Wild Symbol: The Snake is the wild symbol, substituting all symbols except scatter and dice. Free Spins: The ladder scatter symbol is the scatter and gives 5, 7 or 9 free spins if you get 3, 4 or 5 scatter symbols respectively, on a payline. Snakes & Ladders Mini-Game: 3 or more dice symbols on any line you play starts the Snakes and Ladders trail. Like the classic game of old, you’ll roll the die and go around the board, going up ladders and avoiding snakes. Throughout the board, you’ll have increasing multipliers randomly placed, with the highest placed at the very top. You haven’t been this excited about a Snakes and Ladders game since you were 4 years old. Classic, simple, high paying and reliable play makes Snakes and Ladders slot machine is worth taking a spin or two on. You'll find it exclusively to play at mFortune mobile casino.